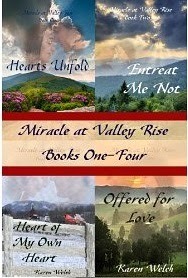 The first four books of the Miracle at Valley Rise Series now in a single volume. Nineteen-year-old Emily Haynes had lost almost everything she loved. Relying on what seems to be guidance from her invalid father, she returns to her past in hopes of finding some sign toward the future. What begins as a joyous homecoming quickly turns into a nightmare when a badly injured stranger stumbles on the scene, his brief presence threatening to alter everything she believes about herself and the plan for her life. Super-star violinist Stani Moss appeared to have everything, fame, fortune and a career guaranteed to bring more of the same, until one hasty decision placed it all in jeopardy. Terrified and confused, he struggles not only to recover his former skill, but to find answers to the questions which haunt him. Throughout his slow journey back, one image lingers in his buried memories of that fateful night—the vision of a girl he’s never met. World-renowned violinist Stani Moss and country-bred Emily Haynes have bridged the distance between their worlds and fallen in love, but neither is prepared for what awaits them on the winding road to happily-ever-after. Their honeymoon may be a European concert tour, their first home a series of hotel suites, but for Emily and Stani, the happy-ever-after has begun. Travel with Stani and Emily through the first event-filled year of their marriage. Familiar characters are joined by a host of newcomers, as the newlyweds move between London, New York and the farm in the foothills. Lives are touched, futures are altered, and above all, miracles abound. Normal for Stani and Emily Moss will always include the unceasing variety of their life. Nothing they haven’t done before, and nothing they won’t look forward to doing again, or so they tell themselves.